Martha Theresa Mikulencak Watkins passed away with dignity and grace with her loving son by her side on the morning of Tuesday, March 19, 2019. She was a kind, generous, and forgiving woman. Martha was born in Granger, Texas on March 2, 1925 to Anton and Marie Mikulencak. From an early age Martha picked cotton in the fields near Granger to working in local stores in order to help support her family. During high school Martha was positively influenced by her dear teacher Miss Sullivan. Martha spoke of her often throughout her life and of the loving guidance Miss Sullivan provided her. After graduating from high school Martha moved to Taylor, Texas and then on to Austin where she worked a number of jobs including at the old Sweet's Grocery Store on West 35th Street at Jefferson and Southern Union Gas. She met Thomas Watkins Jr. through a mutual friend and they were married on February 6, 1949. They were married over 60 years until Thomas passed away in November, 2009. Thomas and Martha had three daughters (one who died in infancy) and one son. Martha loved her children dearly and only wished for their happiness and wellbeing. She mourned her lost daughter and is now joyfully reunited with her. Martha and Thomas worked tirelessly to provide a college education for their children. Martha was a devout Catholic and is grateful to volunteers at St. Louis Catholic Church and to Donna Mokry who brought her communion during her illnesses. The 23rd Psalm was her favorite Psalm and provided her great comfort during her time of need. Martha worked for the Texas State Board of Insurance for over twenty years. Before and after retirement, she volunteered at Seton Hospital gift shop and St. Louis Catholic Church day care and food bank. 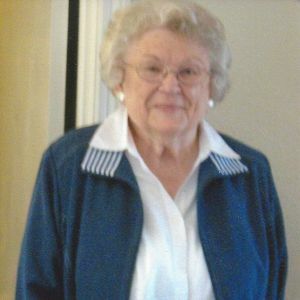 She was a seventy five plus year member of KJZT. Martha loved children, especially babies. She had one grandson whom she loved with all her heart and spent much of her time with during his childhood. Martha was a wonderful baker and anyone who visited her home could enjoy her baked goods, especially her cinnamon rolls, kolaches, cakes, and pies. Her eldest daughter crowned her the cookie queen. Martha was diagnosed with Parkinson's disease over twenty five years ago and worked diligently and successfully to not let it hinder her ability to fully live her life. Martha was a generous soul. One example of her generosity is opening her home on Christmas to anyone she or a family member knew was alone. Even at the end of her life, she was concerned with others' wellbeing. Martha was predeceased by her parents Anton and Marie Mikulencak, husband Thomas Watkins, brothers Joseph Frank Mikulencak (Loretta d.) and Edward Anton Mikulencak, and daughter Barbara Ann Watkins. She is survived by her son Robert L. Watkins (Paul Carlson), daughters Kathryn Watkins (Diane Montemayor) and Dianna Lynn Watkins, grandson Nathan Jones, nephews Erwin Haddon (Vicki d.) and Paul Mikulencak, and nieces Mandy Mikulencak (Andy Dougherty) and Tessa Knox (Paul). Martha and her family want to acknowledge her caretakers who treated her with love and respect including Annie Rosales, Esperanza Rocha, Emma Johnson, Myrtle Tendall, and Virginia Caldwell as well as everyone at Encompass Home Hospice. A viewing will be held at Weed-Corley-Fish Funeral home at 3125 N. Lamar on Sunday, March 24th from 2:00 to 4:00 p.m. followed by a Rosary. Funeral Mass will be held at St. Louis King of France Catholic Church at 7601 Burnet Road on Monday, March 25 at 10:00 a.m. followed by burial at Austin Memorial Park. The family wants to express our gratitude to the volunteers at St. Louis King of France Catholic Church who provided caring help and support to the family during our mother's illness and funeral.